Comfortable, durable and designed for paddling while seated, our bucket seat is standard for all composite tandem canoes 17' and longer, as well as all composite solo canoes except the Vagabond. 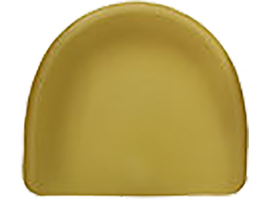 Composite solo canoes receive sliding bucket seats fitted to a floor-mounted aluminum pedestal. A web or cane seat may be substituted at no charge. On canoes with wood gunwales, most seats are suspended from the gunwales using wood dowels lined with stainless steel bolts. Wood gunwale composite canoes can also receive bucket seats. Both web and cane seats can be hung, but not buckets. All tandem composite canoes 16' 6" and longer receive a fixed, riveted seat attachment. An anodized aluminum frame is riveted to the hull to accept either a bucket, web or cane seat. Seat height and seat angle are readily adjusted using our adjustable solo seat hanger system. This system is standard on the Rendezvous, Vagabond, Wilderness and Argosy. It offers five settings of height and angle, sure to please paddlers favoring kneeling or sitting. A simple spring-loaded cord-lock secures the selected setting. Cane seats be substituted. 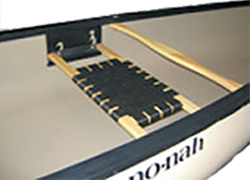 A sliding seat is crucial in longer canoes to establish and maintain proper boat fore-aft balance on the water. A sliding front seat is standard for most composite tandems over 16'. 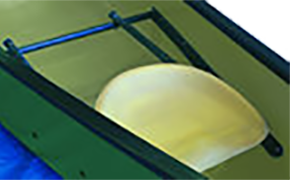 Sliding seats are mounted to an aluminum slide-frame riveted to the hull in tandem canoes. A sliding stern seat is also optional for composite tandems 18’ and longer. Bucket seats are standard but web or cane may be substituted at no charge. Cane seats offer a classic elegance to any canoe and are especially beautiful with wood trim. Cane seats are a no-cost option on all of our models. *Please note that while the wood frame is identical to our web seat wood frame, the cane itself is susceptible to degradation by the elements. 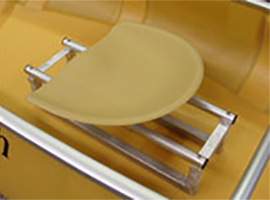 Cool, comfortable and suitable for paddling from a seated or kneeling position, our web seat offers extreme versatility. Web seats are standard outfitting in all composite canoes shorter than 17'. Web seats are available as a no-cost option in all other canoes.